Candace Slater takes us on a journey into the Amazon that will forever change our ideas about one of the most written-about, filmed, and fought-over areas in the world. In this book she deftly traces a rich and marvelous legacy of stories and images of the Amazon that reflects the influence of widely different groups of people--conquistadors, corporate executives, subsistence farmers --over the centuries. A careful, passionate consideration of one of the most powerful environmental icons of our time, Entangled Edens makes clear that we cannot defend the Amazon's dazzling array of plants and animals without comprehending its equally astonishing human and cultural diversity. Early explorers describe encounters with fearsome warrior women and tell of golden cities complete with twenty-four-carat kings. Contemporary miners talk about a living, breathing gold. TV documentaries decry deforestation and mercury poisoning. How do these disparate visions of the Amazon relate to one another? As she fits the pieces of the puzzle together, Slater shows how today's widespread portrayal of the region as a fragile rain forest on the brink of annihilation is every bit as likely as earlier depictions to obscure important aspects of this immense and complicated region. In this book, Slater draws on her fifteen years of experience collecting stories and oral histories among many different groups of people in the Amazon. 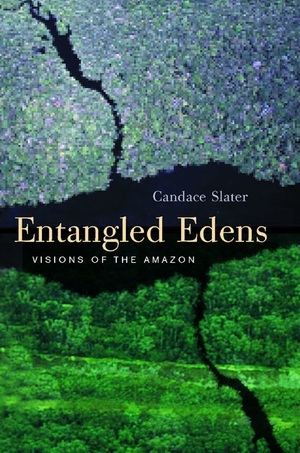 Throughout Entangled Edens, the voices of contemporary Amazonians mingle with the analyses of such writers as Claude Lévi-Strauss, Theodore Roosevelt, and nineteenth-century naturalist Henry Walter Bates. Slater convinces us that these stories and ideas, together with an understanding of their origins and ongoing impact, are as critical as scientific analyses in the fight to preserve the rain forest. Candace Slater is Marian E. Koshland Distinguished Professor and director of the Townsend Center for the Humanities at the University of California, Berkeley. She is the author of Dance of the Dolphin: Transformation and Disenchantment in the Amazonian Imagination (1994) and Stories on a String: The Brazilian Literatura de Cordel (California, 1989).